Since we’re talking about the value of curricular discussions, even when these reveal fundamental disagreements, contested terms, and hidden curricula, I thought I would point out that the Laura Rosenthal and Donna Heiland’s collection Literary Study, Measurement, and the Sublime has just been discussed (and reviewed) in the latest issue of Change. The writer of this article, Pat Hutchings, endorses the approach of Rosenthal, Heiland and many of this volume’s contributors (including myself), which is to use assessment in all its varieties to inquire into what is singular and distinctive about literary studies in relation to other fields. assessment’s focus on cross-cutting outcomes makes perfect sense, but it has also meant that the assessment of students’ knowledge and abilities within particular fields, focused on what is distinctive to the field, has received less attention. And that’s too bad. It’s too bad because we do, after all, value what our students know and can do in their major area of concentration and because students themselves typically care most about achievement in their chosen field of study. But it’s also too bad because anchoring assessment more firmly in the disciplines may be a route to addressing its most vexing and enduring challenge: engaging faculty in ways that lead to real improvement in teaching and learning. What Rosenthal’s and Heiland’s volume shares with the threshold concepts framework Kathryn and I have been discussing is the fact that, as one researcher notes, “getting academics to think about what is critical to learn in their subject is easier than getting them to think about learning outcomes” (7). 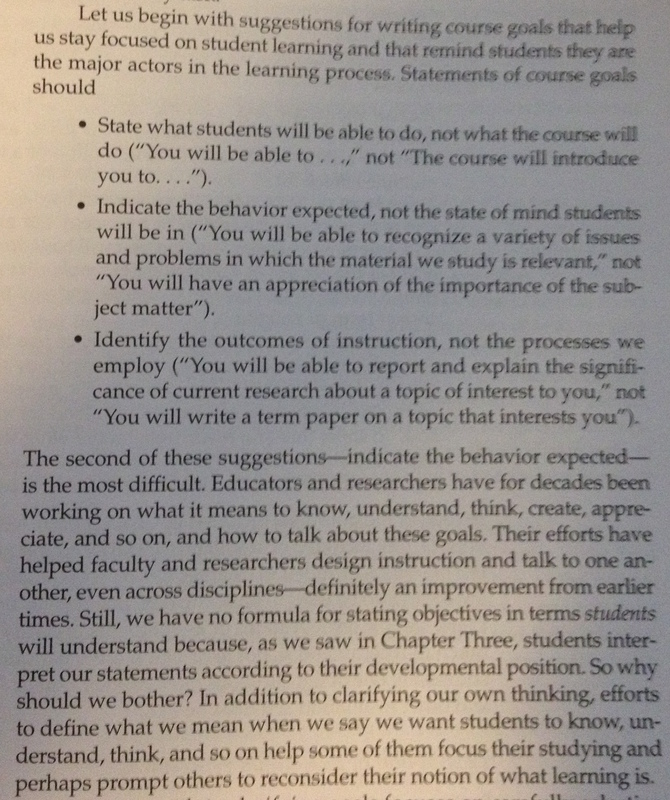 It also addresses a persistent problem in persuading literature faculty to adopt both assessment and student-centered learning, which has been these discourses’ consistent “mortification of the teacherly self” (Cousins, 5), or “erasure of teacher expertise” (6). Such a “restoration of dignity for academic teachers” (6) also helps to address the unsettling suspicion voiced by a number of contributors to the Rosenthal and Heiland volume, which was that the subjective, first-person experiences explored in literature courses would have to be “translated” via social science methodology into something more valued and “objective” before it could be taken seriously by outsiders, whether in- or outside the university community. Beginning, though not ending, with the disciplinary perspective of practitioners and experts seems like one of the best ways to address this disciplinary imbalance.